Teen entrepreneur Shelby Golguski and her brother Gordon created Yourself Expression to share things they love with others—young and old. 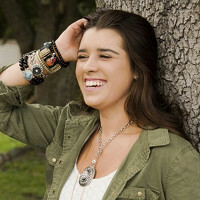 Their Angel Lockets merge customized accessories and an on-trend look perfectly. Each is a great way to express love and remembrance, at any age. They feature filigree-like detailing with crystal accents. 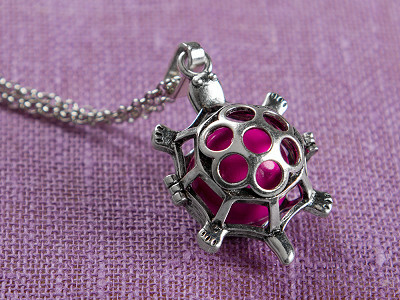 And, instead of holding a picture inside like a traditional locket, each one houses a sphere with a chime inside. You personalize each necklace by choosing the color of the sphere—it could be something symbolic to you or simply your favorite hue. The chime makes a subtle, light sound, serving as a gentle reminder that someone is thinking of you and always with you in spirit. 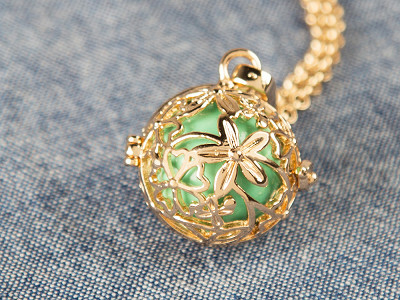 Each locket is meant to keep love and protection around you—or the person you give one to. Hey Everyone, I'm Shelby and can't wait to answer questions for you. Before you ask "why aren't you in school today" I am home schooled so I can work on my business and education. These are lovely. Sounds like you have a bright future ahead of you. Can you change the crystals depending on what style you want? @Duane Thank you so much! You can change the colored chiming ball to any color that you would like. It has a little latch to open it. Do you have anything masculine that would be appropriate to give to a man? Or something specific, like a sunflower? These are so wonderful, but I know several men who lost their wives to breast cancer very recently. @Cindy The most masculine one that The Grommet is offering would be the prayer box. It is square in shape. Our pink chimer ball would be perfect for this as it is a symbol of breast cancer awareness. Our prayers go out to those they have lost. @Shelby We just lost my daughter-in-law to brain cancer. In addition to thinking that this would be a good gift for her mother, I'm thinking of how I might use this for her 5-year-old son as well. Obviously, he's not going to wear a locket on a chain. He would immediately lose it or think it too girly. I'm wondering if you've heard of anyone who may have done something with the charm itself to make it suitable for a young child? A chime would be a lovely way for him to be reminded of his mommy during the days ahead. @vickie I'm sorry for your loss. This is a sweet gift to give. In the past people have taken the locket off the chain and put it on a key chain. He can wear it on his backpack or somewhere special. How many different colors come with a locket? Can a shorter chain be ordered? My son passed away last year and his favorite color was orange. Do you have orange or could I get it? @Garry We are so sorry to hear about the loss of your son. We do not have orange as an option to pick but you are welcome to put it in the gift message at checkout as well as wanting a shorter chain and we will be sure to get that to you. @Shelby Are there more than one ball or can I order more balls separately? Not at the moment, Cheryl, but we'll let you know as soon as we do. @Cynthia Thank you very much! I know you will love them! How long are the chains? What is the silver color made of? Oops. Just found the answers in the details. Thanks. @Laura It is stainless steel, I do not recommend wearing it in water. We offer these at a great price so that everyone can afford beautiful jewelry. @Marian The chimer is hand painted, so in some cases the paint may wear off. It's also 32 inches, so when swimming it may just float right off you! :) We haven't had any other issues with chemical contact. Hi Shelby ! i applaud your entrepreneurial spirit ! Go girl ! 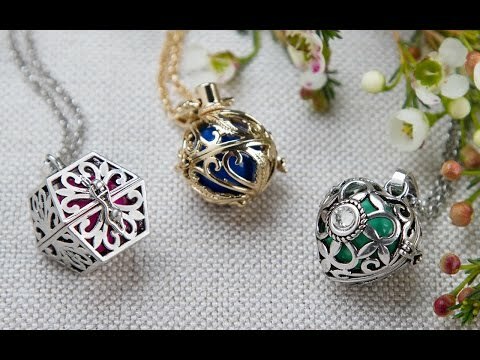 What metal are these lockets made from silver or gold ? @Bob Thank you! I love what I do! They are stainless steel. We wanted to keep them at a low price point so that everyone can afford them. Silver or Gold would just be too expensive. These are beautiful and perfect for teens - keep the designs coming! I love the longer length of the chain. My question is about the metal used: it's ok that's it's not sterling, but I want to make sure if will not peel or tarnish - will the silver stay bright and look good together with sterling jewelry? @heidi Yes, but it is a vintage silver look, not bright silver. We are confident it will look good no matter what you wear it with! 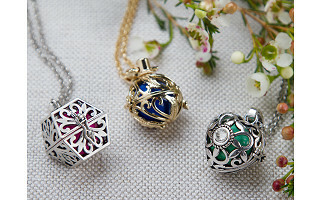 These are lovely... if only one ball comes with the locket can more balls be ordered separately? @Cheryl Right now, were working with The Grommet on offering chimers separately, in a variety of colors! I would love to see a dragonfly in your line!! Although these are so awesome and love seeing the owl, my daughter lost a good friend and the owl totally is significant for Haleigh. @Jenny I will definitely look into creating dragonfly! I'm sorry for your loss, and I hope she loves the owl and the message behind it! Is the chime sound the same for each colored ball? How subtle is the sound? Great idea! Have 2 daughters and, of course, my wife to buy for Valentine's Day! @Don The sound is a very soft and sweet chime. I Think they would love these! Do you have other styles, beside the neck chain, made for men? @trudy We have had many men take the locket off the chain and put it on a key chain! My dad loves his and it hangs on is keys! The square one on a leather thong would be very masculine. @Lynne Very true, awesome idea! Have you considered making some enclosed or with an additional enclosed area that could store a bit of a loved one's ashes as well? @T We're always looking into what our customers want. I will definitely consider that! Can someone with metal allergies where these? @Paula Yes, it's made out of stainless steel.We have not had any allergy issues! The lockets are beautiful Shelby. Is there any "literature" or note in with the locket that explains the meaning behind it, so when given as a gift it is understood by the recipient? An Angel Locket is a necklace you wear as a reminder You Never Walk Alone. 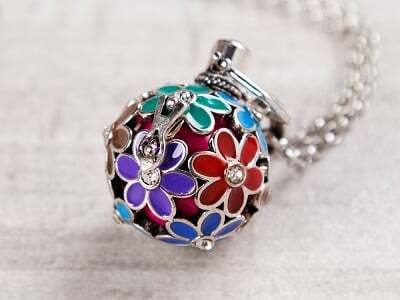 Inside each Locket is a colorful interchangeable Chiming Ball. These chimers have a delicate bell and each time you hear the bell ring you know your Guardian Angel is always with you. We all love someone in Heaven and this is a sweet and comforting way to keep them close to our hearts. Is the stainless steel hypoallergenic? I'm highly allergic to nickel. @Jessica All of our products are nickel and lead free! I can't find a place where I could by more then one chime ball? Possible ? @Guest We are working with The Grommet to add it! What a great idea! How quickly are these sent out? I live in WI and would like it for Valentines Day. @Guest Some have already been packed and shipped! You should get it by Valentines Day. 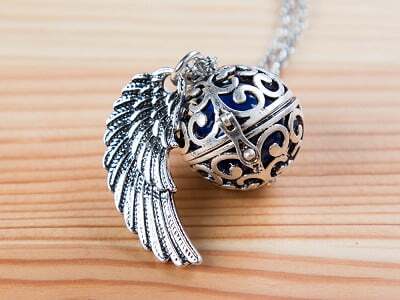 For the silver heart to heart locket there is not option for a blue chime ball? @Lenice I will let The Grommet know! It should be fixed soon. I love reading all the sweet messages everyone is sending with their Angel Lockets! You are not alone, Shelby! There's been a lot of great contribution from the community today. Of course, that'll happen when you have a fantastic creation. @fungift If she loves animals, I would recommend the owl or turtle. Those seem to be popular among teens, and they are super cute! 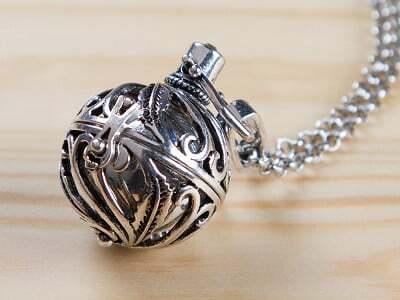 I would like to order the silver heart crystal locket with a purple chiming ball, but that is not an option to order. What do I need to do? @Guest I'll definitely fix it! You can always put in the notes you want purple, instead of another color and we'll get it to you! Hi Shelby. 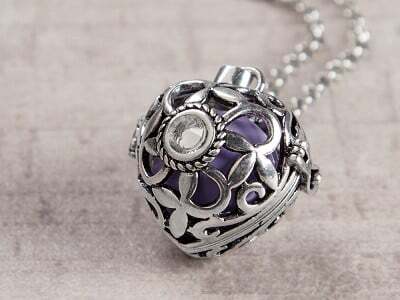 I want to order a silver Heart Crystal locket but need a purple chimer as shown in picture. Purple isn't listed as an option. Is it available for this locket? @Guest It is available, its just not showing up! If you put in the gift message you would like purple, we will switch it out for you. Previous comment answered my question. Thanks. Wondering if turquoise could be color option? 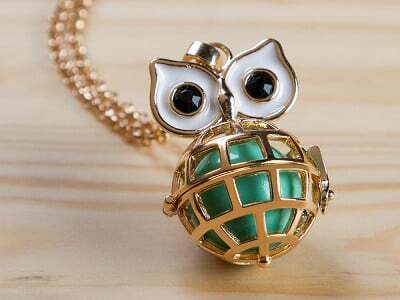 Would love the owl with a turquoise chimer. And saw the comment about the dragonfly, I would definitely be interested in that also! @Susan We are working with The Grommet on adding more colors! Hopefully they will be available soon. @Bill You can go to checkout and order each separately, then add to your cart! We are working to make sure everyone gets theirs by Valentines! @Shelby Some pieces are getting low though. 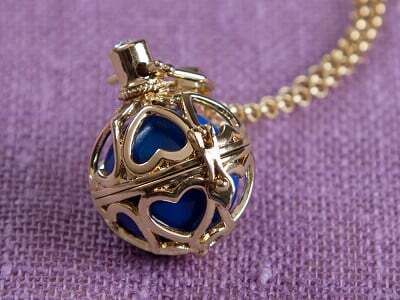 I want to order the heart shaped locket but the purple colored chime ball is not listed on the selection portion of the form. Is this an error and may I specify my desired color choice in another area of the order form? @Pamela You can put your color choice in the gift message section, if you like. They are still in stock though! What is the diameter of the balls? @Sherri I just saw the answer to my question. @Sherri Let us know if you have any other questions! I love these. Trying to decide between the gold and silver. Is the gold painted on or plated? If so will it rub off eventually? This is a gift for my mother in memory of my sister so I would like to be sure to get the choice that will last the longest. @Cate The lockets are gold plated. We haven't had any issues with it rubbing off. We don't recommend wearing it in water. It should last a long time! You don't say how long the chain is. Does it come in different lengths? @Roddy The Angel Locket comes with a 32 inch chain. Thanks everyone for such an amazing launch day! We've shipped so many orders already, and will be back at it tomorrow! I'm trying to order the heart crystal ANGEL locket in silver with a purple chime but in silver the site onlyprovideschime color choices of mint silver and white. How do I fix this? Also I would like to order different color chimes to change colors but didn't see that option or cost. I am assuming the chimes fit in any of the lockets (are a universal size), is that correct? Hi there! Apparently you are not alone because that one flew off the shelves. That was a very popular combo. We'll be working to get everything back in stock in the next few days. As far as chimes available individually, we don't have that up right now, but we might have to with enough demand. @Mike We will work with Grommet to add a few more colors and the other one you love will be back soon. We are working on offering more colors for the chimes. Some of the display pictures show a blue color stone but it isnt available when you go to choose such as the heart to heart locket? It's quite possible, Chuck. Business was booming for Yourself Expression today! 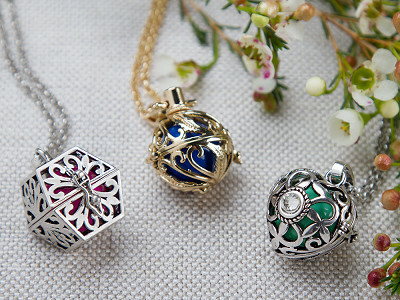 Some of the locket combos are sold out, but we'll get those back as soon as possible. @Mike We will update the inventory as soon as possible. We should have the blue soon and a couple other colors to choose from. These are beautiful. I was wondering if you have plans for a dragonfly? I know my mother would love one of these. When my grandfather passed away, we were at the graveside and there was a dragonfly that showed up about the same time we got there. It stayed through the whole service and the 21 gun salute even, flying back and forth between my mother and her father's casket. She knew that it was him, there to check on her and the family and to let us know he was ok.
That is an amazing story, Lisa. I don't know if Shelby had a dragonfly design in future plans prior to today, but if not, I bet she does now. We'll keep you updated on any additions we make to the site! I am curious if you are going to design any others? Possibly a butterfly or other items. Do you offer the chime in a dark blue or turquoise color? @Guest Yes, the Blue in the selection is a dark blue. The mint is also similar to an aqua, just a little lighter! Is there a reason why some necklaces will only allow certain color chime balls? I tried the Heart to Heart and the Spiral designs and neither would let me choose silver with a blue ball, and on some if I chose the gold finish then it would let me pick the blue ball. @Linda We have a certain inventory per locket with color chimer. We are working on updating the inventory, but we do have both of those colors in stock. You can always put in the gift message the color chimer you would like and we'll switch it for you. I am considering buying several for gifts. Is there a way I could choose a 24" length? Also the dark blue in the pic does not seem to be available in the heart to heart as shown in the photo. @Sandra At this time the locket only comes with a 32 inch length. 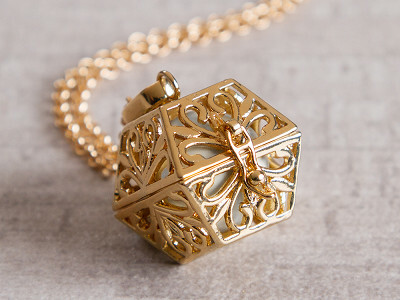 The long chain allows the locket to hang so you can hear the chimer! If you do need a shorter length for a young girl, please put it in the notes, so we can help you!